I played a speed 9 today after work and before dinner. Some people love to go to the gym and get on the treadmill for an hour. I prefer to play a quick nine. 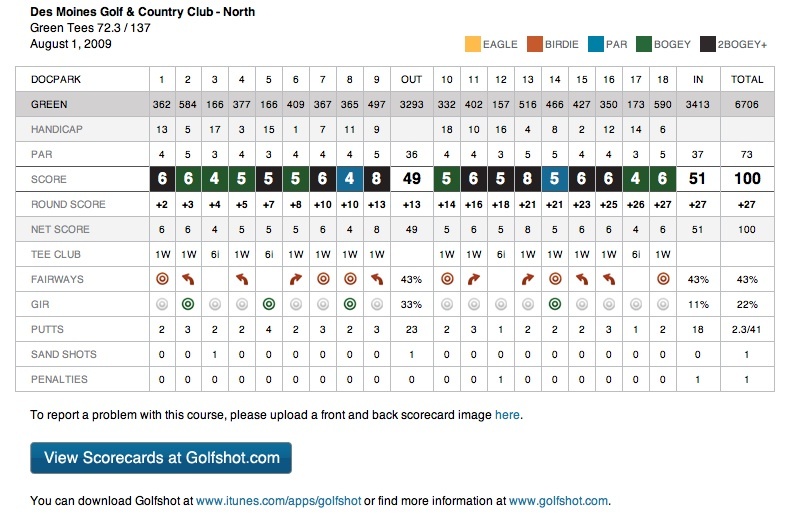 After my recording a 76, a score lowered by the format of the tournament, but listed on GHIN for the sake of completeness, I played today and had a reasonable round of golf -more in line with how I usually play. I hooked my first drive into the woods. I spent about 15 minutes looking for it, and found it. It’s a luxury to play with nobody behind you, and in finding the ball, I didn’t have to go back and hit another one. I hid a beautiful fading 7 iron over an obstructing oak tree back onto the fairway, and fluffed my pitch, with a subsequent long and short putt, I made double, which on #1 is a common score even when you’re on the fairway. #2 was fired with the 10mph right to left wind -I shot a perfect fade which straightened out, but was short because of how high I hit it. I pitched short, but made a remarkable 15 footer for par. #3 was a bogey of not much note -I missed a 5 footer for a par save. #4 was a great sand save, with an up and down for par. On #5, the trouble began. I couldn’t hit an approach shot for anything and ended with a triple. #6, I hooked OB and struggled to get a triple. #7, lost ball and a triple. #8, OB left and subsequent triple. The stretch of four triple bogeys gave me some perspective. I was swinging away without much purpose, and the purpose of the game is to make physical a mental and even spiritual plan of action. Keeping my thoughts in the moment, I had the same hard 10mph wind now left to right and slightly from behind. I took a 6 iron and played my natural draw. It almost hit the flagstick and landed 15 feet behind. I visualized the line and executed -dropping the putt for birdie. This game is at first a purely physical one for the 90+ shooter. In the 80’s, it is a game of processes -pars and bogeys. To get the the 70’s and closer and even under par, you have to get spiritual. I left #9 thinking I could reel off five or six more birdies. I was quite sure of it, but didn’t feel overly pressured to do it. I went home for dinner. Not all that unhappy about my 4 triple bogeys, but contemplative about my one birdie. Addendum: By slowing down my swing over the weekend, I managed to hit over 70% of my fairways, and reach 60% of the greens, but was troubled by putting -this was because the Stimp meter was running out at close to 12 feet! At Oakmont speeds, I was rolling the ball over the holes or lipping out. 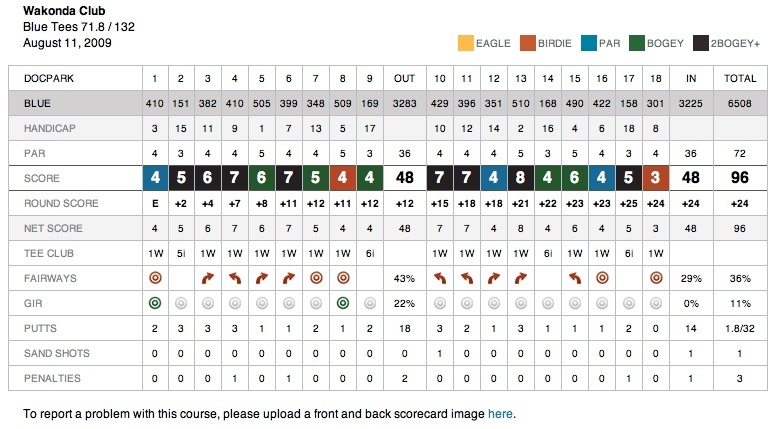 Earlier this week, after work, I played after the greens were a more manageable 10.5 feet on the Stimp, and I shot a 41 and 47 for an 88 -the back nine was done in a rush and I had three triple bogies due to errant tee shots. Slowing down the game, visualizing -trying to see the ball lying in the grass, the terrain, the sky, the wind, the trees, the green, and above all the target, really does pay off. Also, my putting improved after copying Wie’s putting changes -hand press forward, no slap, athletic spine posture. Golf Transparency -what to do with the 76? Submitted for you consideration is a recent quick nine holes played yesterday evening. Though not as dramatic as my recent 76, it does show an important trend for me -that I’m putting better and I am hitting some very nice approaches. Number 7 was a bogey that shouldn’t have been -I drove right, topped an intended punch in to the fairway bunker 138 yards out, and landed an 8 iron to 6 feet -missed par by millimeters. Felt very comfortable in my skin throughout -even after the topped punch -I breathed and moved on. In retrospect, I had no business trying to fade punch out of deep rough. I thought about the 76 and whether to submit it to GHIN. I think because of the format, it basically takes 12 strokes off your likely score. 88 is definitely in my wheelhouse. But in fairness, I certainly don’t feel like a 22 handicapper, and think my game has turned around. So is GHIN something you gin up, something to spin to an “appropriate” level? I think you just have to report everything, unedited. The Handicap is designed to reflect your average, but also your potential. I know my potential is there from where I’ve been and where I want to go. There is nothing to gin up -you report your score. That is golf transparency. The 2009 HAC was played yesterday with the highest attendance ever. The teams were composed of an A, B, C, D level player and played on a 6/6/6 format of individual, shamble, and scramble format based on the difficulty of the hole. Waveland offered a challenging, classic layout and it was spiced up by a torrential downpour around midday. My round of 76, with help from my team on the shambles and scrambles, was a bit of a revelation. 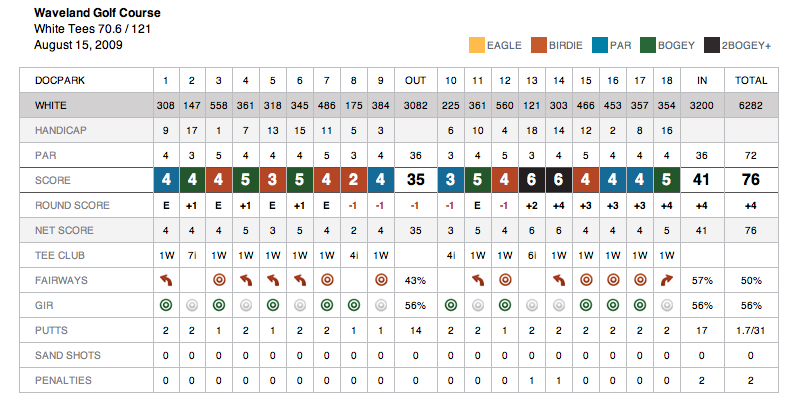 I had six birdies, four of which occurred on an individual or shamble hole. I was playing in a different place with no fear or thought. I was possessed of a great awareness and presence, but had no definite perception of space or time. It was just ball and myself, and a pleasant time moving through the grass. Every component of my game was functioning, and even the triple and double bogies that occurred during the downpour were snap hooks out of bounds with a slippery grip, and I played after stroke and distance bogey and par on those holes. The putting was just simply perfectly dependable with an occasional long putt going in. I hope this lasts through the rest of the season. I attribute some of this to a book I read the night before the tournament -Zen Golf: Mastering the Mental Game by Joseph Parent (link). Will keep you updated. We won by the way, thanks to the efforts of MD, TB, and TW. Thanks to all! 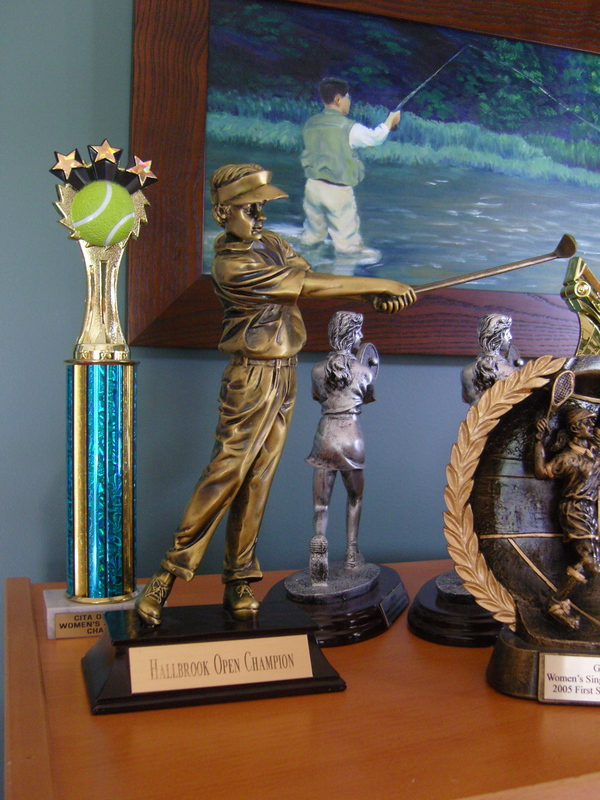 Here is the HAC trophy, also known as the Wedgie, sitting alone among my wife’s numerous tennis trophies. While playing in the recent HAC, my good friend JN showed me his new iPhone 3GS which was pretty cool. What was even cooler was his golf round management system. 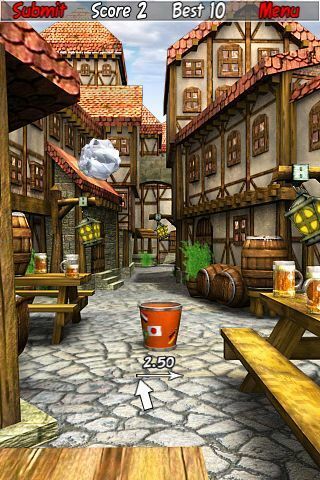 It is an iPhone app called Golfshot which in terms of design and features matches up and exceeds View Ti on many counts. He showed me how each shot can be stored for statistical analysis, how yardages to different spots on the fairway can be graphically demonstrated along with distances for the next shot. I downloaded the app and was immediately disappointed to see that Wakonda hadn’t been loaded. I went to their website (link), and requested the course. This requires taking a picture of your scorecard and emailing it to them, or as I did, scanning it and emailing it. The process is described on the website as requiring a week to map a new course, but to my pleasant surprise, I got an email within 24 hours that my course was now available. What’s great was that all the tees were available -except for black which are the tips. I’ve emailed the support team. As with View Ti, I will post this review as a mini-blog -and I have a free weekend coming up! Playing at Wakonda, I found it to be of limited utility as I make it a practice to know my own course. 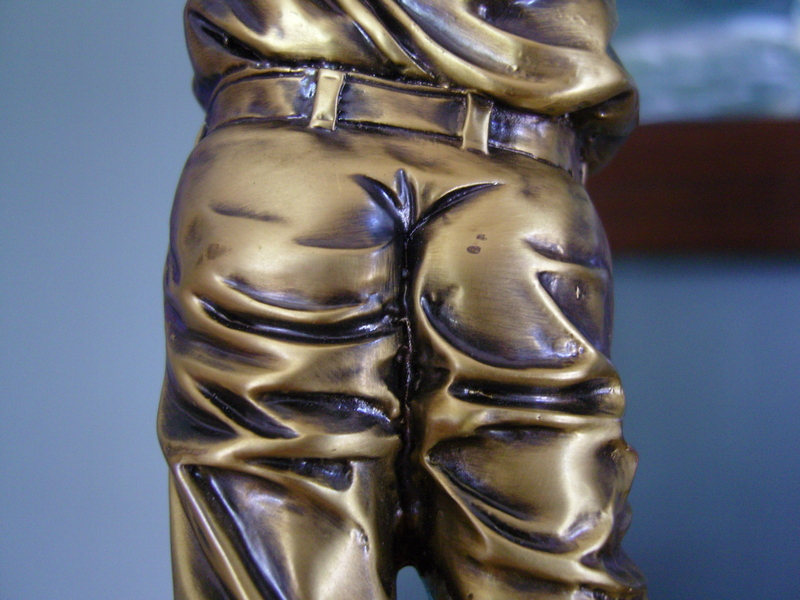 For this reason, View Ti Golf is rarely turned on as well. Yesterday, I was invited to play with WW at DMGCC, and this was the moment I was waiting for to try Golfshot -playing on a new or rarely played course. I also tried out the scoring and stats function. 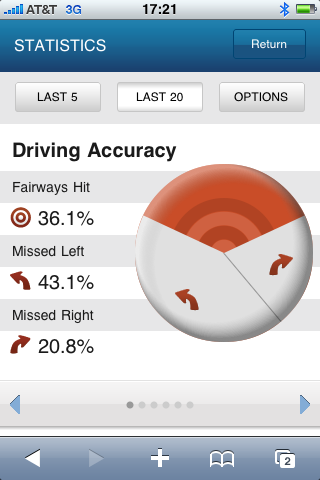 The GPS accuracy is not too bad -no different from View Ti Golf. The one convenience is the little GPS status icon which goes from red (seeking) to green (satellite captured). With it green, it takes anywhere from 5-10 seconds to settle on a read, and it is very close to the pacing off fixed markers on the course. On the tee -facing a blind shot over four bunkers, I really had no idea where or how far I needed to hit. The picture is to the right -the green was about twenty feet below on a dogleg right. It looked like I needed at least 200 to clear the bunkers, and a safe bailout to the left would probably leave me far away from the hole. Golfshot trumps View Ti in its graphics and interface particularly for planning approaches. I brought up the aerial view and moved the target bead to various trajectories over the bunker (below). Carrying the drive over the second bunker 250 yards would set me up very nicely. I aimed over the rightmost bunker and set up my draw which had been behaving most of the front nine and I clocked the drive and ended up on the left fairway about a 100 yards from the pin, setting up sand wedge approach from a downhill lie which i placed 10 feet from the pin. Unfortunately, I two putted for a par. The greens at DMGCC are all tricked out because the property is build on cornfields and feature false fronts and anatomically correct curvatures, apertures, nooks, and crannies. The scorecard function works very nicely -I didn’t notice you can also log your tee off club, but the stats don’t lie -my drives worked well when I was controlling a mild draw, but failed when I blocked out and faded -a disaster when you’re set up for a draw. Also, some of the greens gave me fits and 3 and 4 putts put the nail in my coffin. 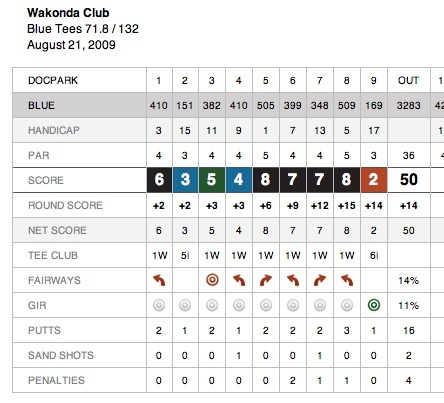 I was very impressed that finalizing the score resulted in an email of the scorecard to my inbox. One notable difference from View Ti is the GIR is autocalculated -if you two putt for a par, it is assumed you hit the green in regulation. It takes about 3 to 4 clicks to put in your scores and stats which is a real step up from View Ti Golf with their really awful X’s and O’s which only a professional caddy would love. Other features, which I will expound on in later entries, include the distance of last shot feature -works okay but not if your call is interrupted by a phone call or if you leave the program to check email -not the programs fault but the way the iPhone OS is set up -something that they have to address in their next tablet, and listing of yardages to hazards and important landmarks -very useful. In comparison to View Ti Golf, this program is very well thought out and clearly not a flurry of hurried addons and upgrades which View Ti Golf has been suffering from. I think View Ti Golf was the early leader, but Golfshot GPS trumps them in interface, utility tee to green, and in statistics which weren’t too difficult to track. That being said, I do have to say that View Ti N’s no nonsense yardage to hole only feature at rock bottom pricing offers a cheap, functional alternative to both View Ti Golf and Golfshot GPS. The only shoutout I have to both software houses is why with all the fancy GPS do I have to select the course that I am on. When I am on the first tee of DMGCC’s North Course, the iPhone has that information, but I still have to wait and get the list of “nearby courses” and then select the correct course. Also, the scores should be dumping into the USGA handicapping database along with course, slope, and handicap. 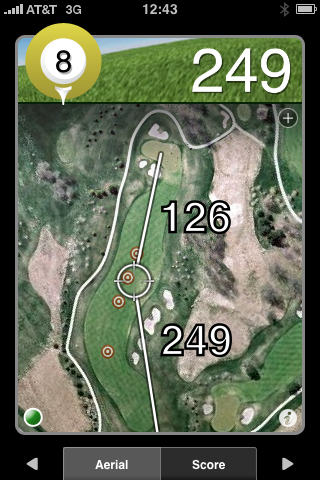 I like Golfshot GPS a lot. I think View Ti folks will have to seriously hunker down and change the way they record their courses to bring on the features that Golfshot GPS pwns even as they revamp the interface -a lot of geek work which will take about 6 months to a year. Golfshot GPS proved its worth on this blind shot. It’s on number 6 at Wakonda, a longish par 4 made longer by moguls. The drive which nice and long set me in the valley behind a hill beyond which is another valley that collects approaches that are short of an elevated two tiered green. When the pin is on the left, upper tier, you have a 10 foot strip to land on or end up on deep rough to the left or on the lower tier to the right -both pretty much means double bogey is a good score. This tree blocked any high approaches and I needed to cut a medium length iron starting to the left, having the wind lift the ball and land it softly on the upper tier, but which club? The nearest marker was far away, and this is where Golfshot shined. After locating the pin from top of the hill, I was able to get a distance to all the possible hazards. This let me choose an 8 iron which when I open the blade goes about 133. I reckoned the pin to be about level with the ball. I hid a hard fading shot that avoided the limb but the wind didn’t cooperate and the shot went long and slightly left of my intended target. Being in the rough to the right meant a very delicate chip. It took me five more strokes to finish out the hole with a triple bogey. The club selection was correct, but the left to right wind in the face was not there. The real strength of Golfshot GPS is in the scoring and stats department. It runs beautifully and well on my second generation iPhone. At the end of the round, I emailed myself the card for later analysis. This round revealed the problem that I need to address going into this weekend’s HAC tournament. My driving is very much off -I hit only 35% of fairways, and this resulted in a lot of needless scrambling. As I was playing by myself, I took unnecessary risks and mostly they did not pay off -I will decrease the risk reward spread by keeping triple bogey off my scorecard this weekend. I made 5 triple bogeys and three double bogeys -if they were merely bogeys, I would have shot 83. My short game was streaky. I have been working on chipping and putting and it has paid off in the two birdies I had -it’s been a while since I had two birds in one round. 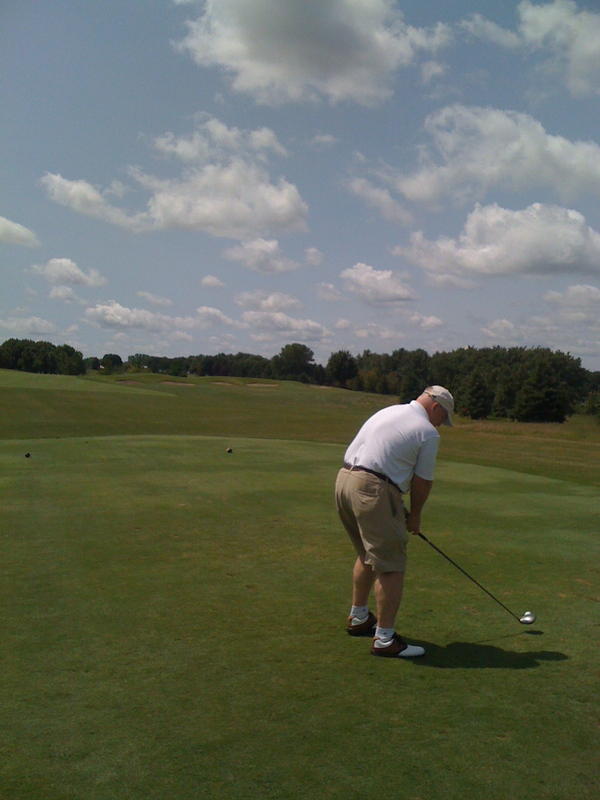 Golfshot lets me identify my problem -that is my driver has to not duck hook and I have to work harder on my mid-irons. My putting has to be less aggressive in spots where bogey is better than double, and double is better than triple. I’m really beginning to like this program primarily for the scoring. I used the program at Waveland yesterday during the HAC. 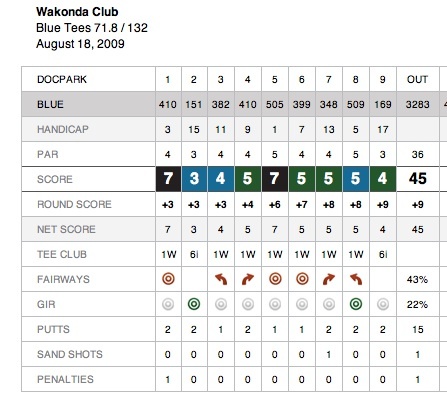 The scorecard from that is in my HAC 2009 entry. There was a hole where the program really showed its usefulness. I sighted a blind uphill 165 yardish approach with both the yardage and trajectory to the trees behind the green which I could see from where I was. 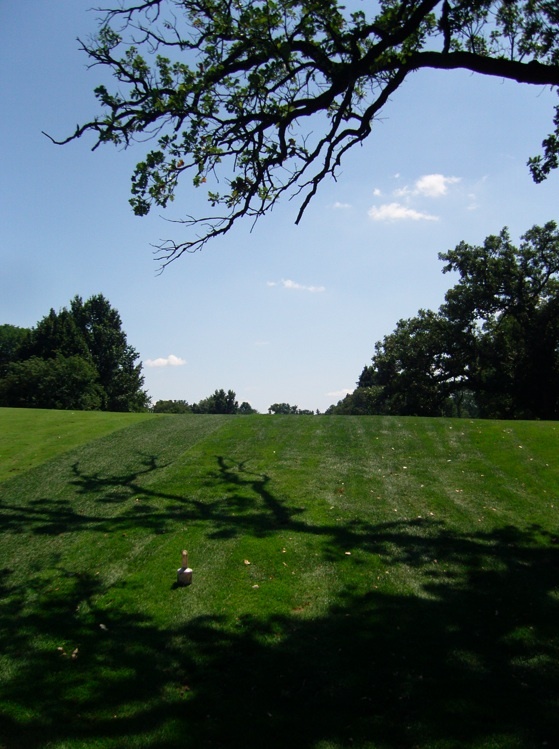 I squared up a 5-iron, put my shoulders in line with the slope of the hill, lined up on the tree that Golfshot predicted, and swung away after a final exhale. The shot which I did not see land, was reported to have landed in the front of the fringe and rolled up to 8 feet from the cup. I put this putt in for birdie. 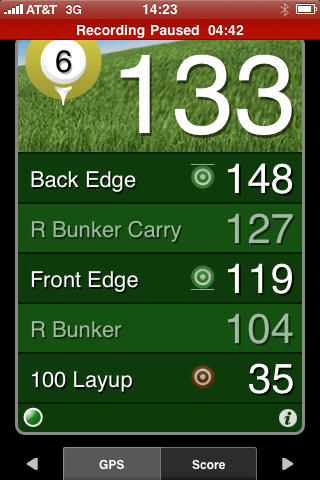 The stats function is by far the coolest feature of Golfshot which works well with the flow of a round of golf, much better than View Ti, and the layout and graphics of the emailed scorecard speaks for itself. GPS on iPhone and basically in the US is only so-so accurate and it takes about 10-15 seconds to get a lock. Battery usage wasn’t terrible -this while I was skimming the PGA tournament. 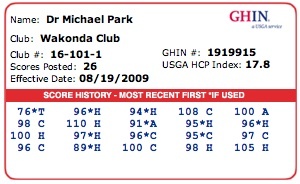 BTW, it was a great weekend for golfers of Korean extraction. I got down to red by the end of the round, but never worried it would blinker out. Played around with the stats segment. It goes to a mobile Safari link that shows you your stats broken down by major category and over 5 or 20 occurrences. For example, my driving accuracy is pretty mediocre at 36%. I miss more the the left (draw) than the right (blocked out). There is also GIR, Putting average, Recovery Performance, Scores by Par, and Scoring. I am happy to report I am averaging 1.9 putts per hole which has been my goal since beginning of summer. Scores by par tells me that I play bogey on par 3’s and 5’s, but tend to play slightly over bogey on par 4’s. This is all very nicely presented in a tidy fashion. 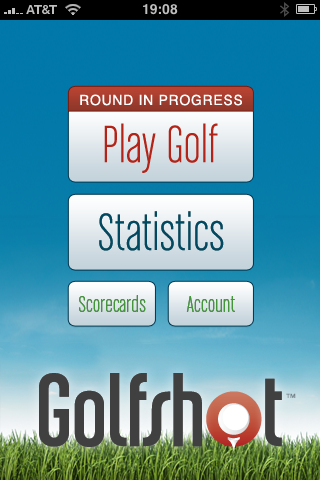 Golfshot keeps your database available over the web and on the iPhone -nice. I have discovered midsummer nirvana. A Zen activity requiring aim and dexterity all accomplished from recumbancy – it is the simple game of tossing a scrunched up piece of paper and tossing it into the waste basket done outside with wind. Addictive like that balloon popping game or Tetris.